A couple years ago, on Feb 25, 2016, Connie and I arose in the early 4am hour and proceeded to drive to Ann Arbor in cold, darkness, during a terrible snow storm. We made it there and I received my last Erbitux treatment (read the post). Fast forward to today and it’s been two years without any treatments. And three years with no evidence of disease. Today we left at 8:30 AM heading to Ann Arbor for an appointment with Dr. Krauss (pictured with me in this post). We were looking forard to discussing scan and blood test results and next steps. In stark contrast to two years ago today was sunny, warm, no snow, and no rain! The results of these latest round of tests have once again fulfilled our hopes and prayers. The CEA blood test continues to stay under 1.0 (indicating no cancer activity) and the scan results (lungs/chest and abdomen) show no signs of metastasis. Dr. Krauss also reported that I will move to a six month surveillance cadence and he is going to schedule removal of my port as well. It is so hard to believe where my battle is today. Beyond my wildest expectations, I have landed in the best possible place. I am truly Blessed and grateful beyond expression. Of course we thank God for this glorious news. And we also thank the many people that God works though every day, helping many cancer patients all over the world. 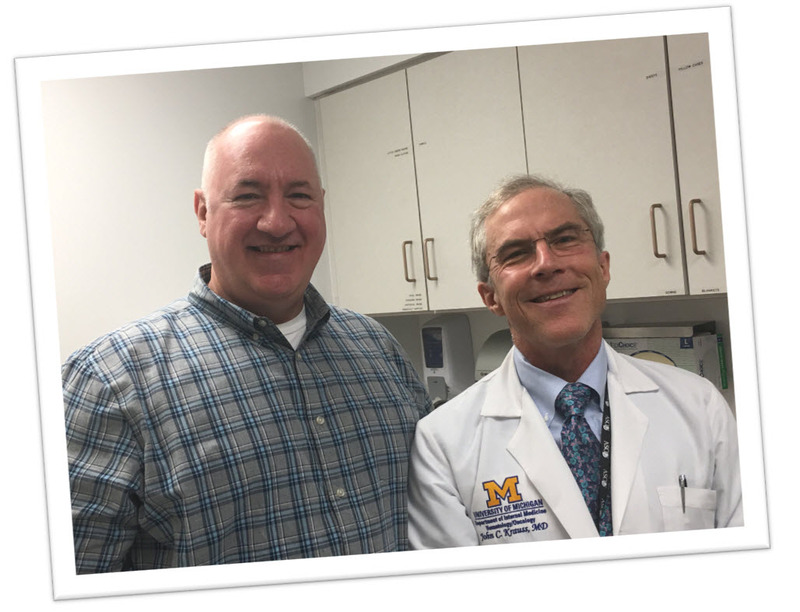 We especially thank Dr. Krauss and the University of Michigan Health Care team. They were most awesome for us and we are forever in debt to them for their dedication and excellence. 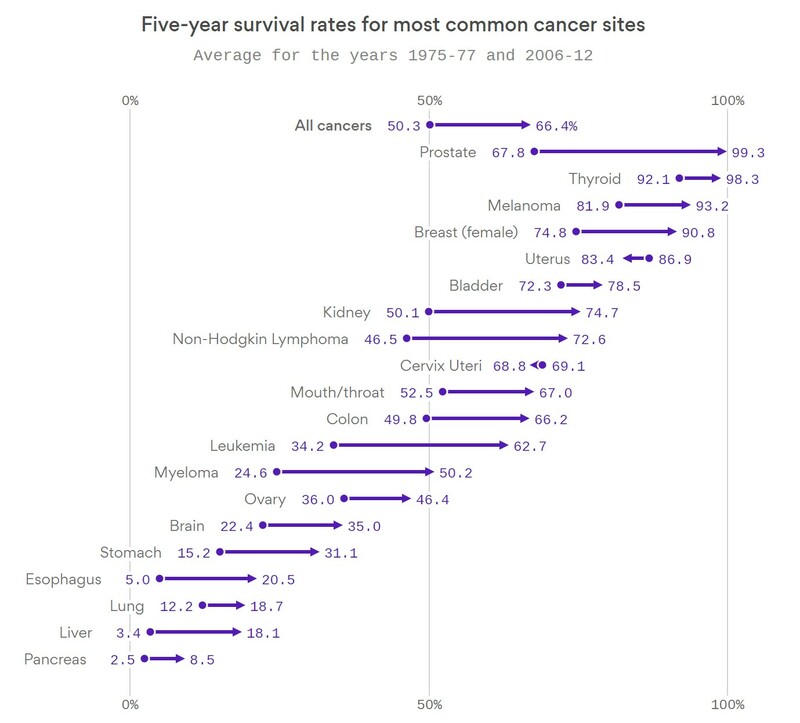 In discussion with Dr. Krauss today he pointed out that over his career there have been substantial gains in cancer survival rates overall, citing a study posted on axios.com. The chart from this study is included below. Colon cancer has seen an increase in the five year survival rate from 49.8% in 1970s to 66.2% today. Most cancers have seen significant increases in the five year survival rate. While we all would love to see cancer eradicated entirely, it is very important to recognize the significant gains that our medical field has made in a rather short period of time. This is especially awesome news to someone newly diagnosed with cancer. There is definitely hope! And even hope for being cured from Stage IV colon cancer. It is very important to point out that YOU have a role in making sure these gains continue. Eat healthy, exercise, quit smoking, and do what you can do to reduce your risk of cancer. Additionally, if you have symptoms YOU need to seek out medical attention sooner rather than later. Do not ignore symptoms. The earlier a diagnosis is made, the better odds of being cured! Thank you Jesus for the additional time you have granted me on this beautiful earth. Thank you for the wonderful medical care that you have brought into my life. Thank you for allowing me to hold two new beautiful grand babies this past year. Bless all those helping to make such great progress in the care and treatment for all cancers and help them to accomplish break-through improvements in the upcoming months and years! And guide me in using my time wisely; in service to my family, friends, colleagues, and fellow mankind. It’s been a little while since I provided an update. 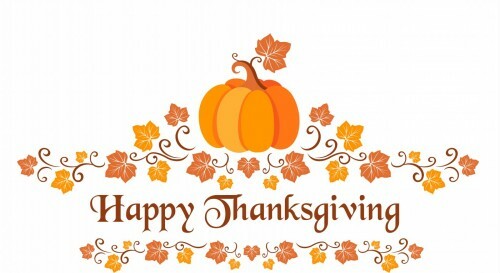 So I thought I would do a quick check in with you and share an early Thanksgiving Day greeting. As last reported Bryce had a primary spontaneous pneumothorax (collapsed lung). We went in for a follow-up and his surgeon gave an “all clear.” He has healed quickly and completely! And thank you all for your prayers and support during that unexpected event. Connie and I met with my oncologist yesterday (11/2) and we received all good news regarding my recent scans and blood tests. The remission continues. I have a colonoscopy scheduled for later this month and CT scan / blood tests scheduled for February (another four month check-up). If these upcoming tests are all clear I will move to a six month surveillance schedule and have the chemotherapy port removed. Woo Hoo! I have to admit, I really don’t like going in for scans, so having more time in between scans is very welcomed! Not only is there the anxiety wondering about results and such, the actual scan causes me physical sickness. Another fun thing I get to do is colonoscopies every couple years and time is approaching for another one of those. However, I will not complain about the colonoscopy procedure for fear of discouraging someone. If you are over fifty PLEASE make sure to do this!!! This is not simply a test to detect if you have cancer it is potentially a PREVENTATIVE procedure. It just might literally prevent you from having to go through chemo, surgeries, and all the tests in between. Please be smart! Connie and I are on vacation next week. We are super excited to go and meet our first grandson Franklin. We scheduled this vacation for couple weeks after Sarah’s due date but she went ahead and had Franklin a couple weeks ahead of her due date. So as it turns out we will meet Franklin and celebrate his 1 month birthday with him. Life is good and we have much to be thankful for. And I am especially thankful for your continued prayers, positive thoughts, and support. For me and my family. God is good and He truly does answer every prayer. Not always exactly what we ask for, but always exactly what we need! God’s grace has given me additional time on this great earth and I pray to use it wisely, in service to all my brothers and sisters. Glory be to our Father in Heaven! Prayers for the people affected by the recent tragedies in Las Vegas and New York. May God shower much Love down on all those hurt by such senseless and evil acts. 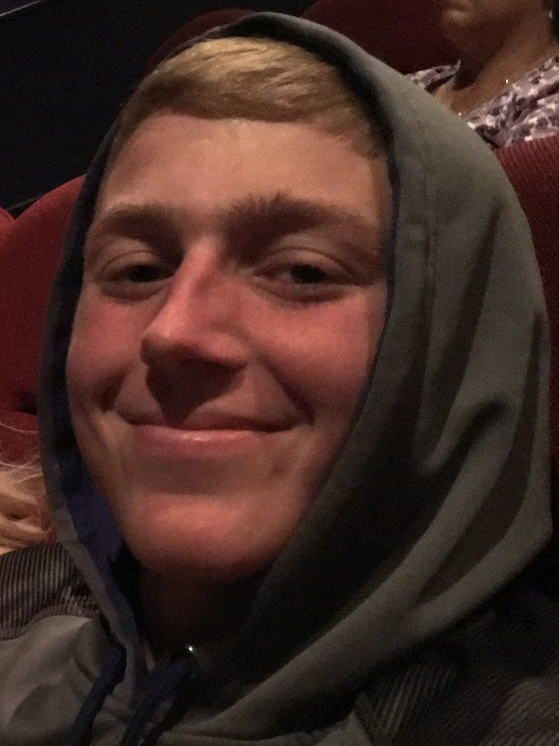 Bryce will undergo surgery today, Sunday 7/30 (started surgery at 2:00 pm), at Bronson Children’s Hospital in Kalamazoo. Your prayers for the medical team and for Bryce are requested. When he continued to complain of shortness of breath we (the bad parents) finally took him to prompt care in Marshall. Prompt care ordered an x-Ray and soon thereafter we were in an ambulance headed to Kalamazoo Children’s Hospital. The good medical team at Bronson Children’s Hospital inserted a chest tube on Saturday 7/22 allowing his lung to reflate. They explained to us that in fifty percent of the cases the patient heals and no other treatment is required. He was discharged from the hospital with the hope of putting this behind us. Unfortunately, on Saturday 7/29 we returned to the ER as Bryce was again feeling shortness of breath. The Pneumothorax recurred. Bryce was in the “other” fifty percent that required additional treatment. This condition is not uncommon and tends to occur in young adult males, tall and thin. In cases like his the patient has blebs (balloon like tissue) that usually forms on the top of the lung. This tissue can spontaneously pop causing the lung to loose air. The surgeon will remove the blebs and help the lung reattach itself to the pleura. Bryce met with the surgeon today and Dr. Leinwand was impressed with Bryce’s research. Bryce read all about the Surgeon’s credentials and also discovered that he was recognized as a doctor that gives 110%, treating his patients as a fifth child. Additionally, we learned that Dr. Leinwand was somewhat famous for singing to a patient. The patient posted a video of the singing doctor and it went viral. We are happy that Bryce has a doctor who truly cares about his patients. 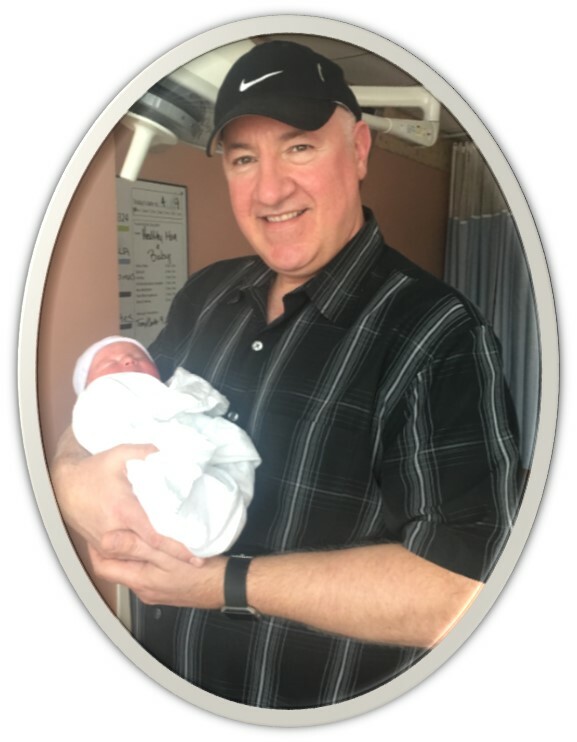 Please Pray with us that the Lord’s healing is delivered through Dr. Leinwand and the Bronson medical team. That Bryce is fully healed. That his pain is managed throughout this ordeal. Your prayers are truly appreciated. So many Blessings to ponder during this Easter season! On March 31, University of Michigan blogged about my battle with Stage IV Cancer (link). A theme in the article was about trust. How I trusted in the experts, a hunch, my family, and community. In retrospect I believe that the author of this article detected Trust during her interview with me; however, she may not have understood the foundation of this Trust. I’m here to tell you today that the Trust she sensed is my trust in our Risen Lord, Jesus Christ! I really didn’t know how these past years would actually turn out. I knew the odds; after all, I’m a numbers person. I knew that I had a 5 to 10% chance to live five years from diagnosis of stage IV cancer. But I also knew (trusted) that no matter what transpired; that the Lord would watch over my family and keep them safe, even if I was called home to heaven. Even though I didn’t know what the Lord’s plan was, that didn’t stop me from hoping and praying for continued time here on Earth. And for asking you all to pray on my behalf. To raise me up in prayer. I remember a time in 2012 (link), with tears rolling down my face, I wrote about my wife Connie and our plans together. I wrote about wanting to see our children become independent and about wanting to spoil our grand children together. At the time I was writing this I asked for you all to pray for Connie and my family instead of me. I simply was not sure how things were going to turn out. And I was heart broken at the possibility that I might not ever hold a grand baby in my arms. On April 9, 2017 Blakely Jean was born to Anna and Charles. We are so blessed. Beyond anything I could have imagined. These past years were filled with weddings, a baptism, the birth of our first grand baby, birthdays, anniversaries, more weddings (nieces and nephews). And a confirmation is coming up in less than a week. So many blessings. So many moments. Google is an incredible tool for sure. I’ve turned to google many times to find a perfect image to include in a blog update. But today when I went looking for an image to express Happy Easter to you all I was a saddened at what I found. There were hundreds of images of Easter bunnies, colored eggs, baby chicks, and chocolate baskets. I fear that for some these secular images are all that Easter is to them? I hope that this is not the case. While these images are a part of Easter that is not what it’s all about! I did find one image that represent the Easter I know. To me Easter is about eternity. It is true that our human bodies will die. Some of us will live longer than others but our bodies grow old and eventually give out. Some people sadly believe that human beings only exist for a short time on Earth and then slip away into darkness, die into nothingness. How can anyone believe that they don’t have a soul inside of their physical body that is as young as the day they were born? A soul that will live beyond death! The message of Easter is that death is not the end of our existence. We are created with a soul that will endure beyond death. We are created in the image of God. We are created for an eternity of time with Jesus. Jesus paid the debt for all of our sins. 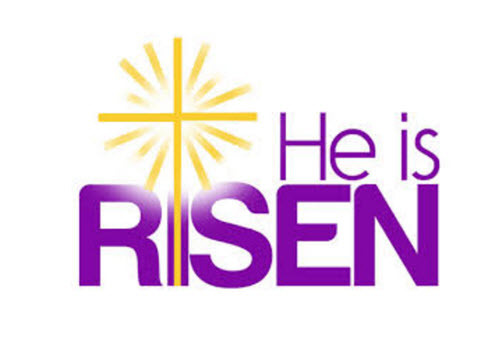 Then He rose up and conquered death! And paved the way for us to live eternally with Him. Alleluia, Alleluia! The Lord is Risen! Today marks the one-year-anniversary since my last chemotherapy treatment for cancer. On 2/25 last year I received my last Erbitux treatment. Thanks be to God I continue to be cancer free (or NED as the cancer survivors call it — No Evidence of Disease). I went in for a CEA test and scans last Thursday morning. All the results are in and once again, all good news. The CEA test (the blood marker for colon cancer) continues to be under 1.0 and scans continue to show no evidence of metastasis! The contrast injection for the CT scan proved again to be a challenge for me. I honestly don’t know how I managed all those other scans without getting sick. These last two scans were pretty rough. Even though I did take an anti-nausea medication this time it simply didn’t help. Hopefully we can figure this out before the next scans. Thank you all for your continued prayers and support. Your prayers lifted me up to our Lord and his mercy has brought me through this battle thus far. Words can not express how grateful I am! 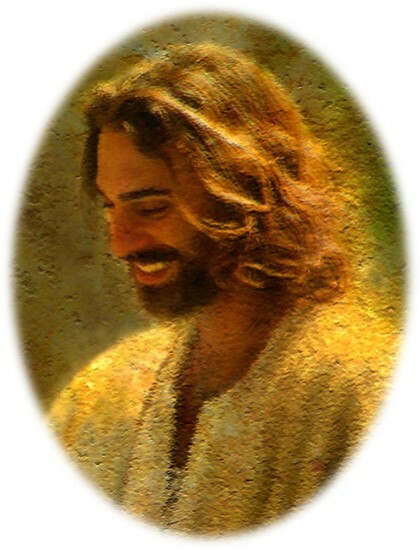 May our good Lord look upon you today, may Love warm your heart, and Jesus’ smile guide your way. God Bless and Keep You Forever! One of the carcinogens is Titanium dioxide. It is also commonly listed on the ingredients as E171. 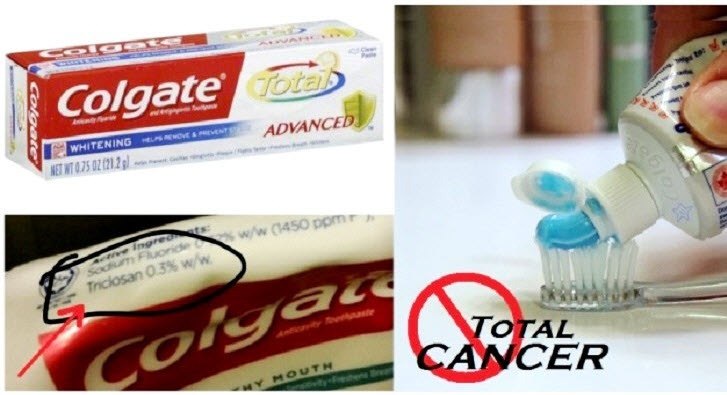 There are other chemicals used in most toothpastes that are also considered dangerous. I’m going to pick up some new Toothpaste today. Check out this site for a complete report on safe toothpastes. Also, as a friendly reminder – Colonoscopies can save your life! A colonoscopy can prevent cancer. During this 15 minute procedure the doctor may encounter and remove precancerous polyps. And because more and more people (over 50) are getting colonoscopies, colon cancer is one of the few cancers that is trending down in people over 50. Very Important! If you are 50 or older, make sure to get this done.